I felt happy and relieved after Sunday’s game and I hope you enjoyed the moment as well. That’s how the manager’s email began and it was exactly how most Gooners must have felt, happy and relieved. Happy St. Totterginham’s day to you all. Once again it’s gone down to the wire and some last gasp defending but here we are. Champions League football, or at least a chance to qualify for the group phases, sweetens the deal. Or is it the other way round? Anyway, apologies for the lack of the pregame article. I usually write it late in the night before the day of the game but this weekend was just too hectic and I just didn’t realize when it came and went. In a way I’m also glad I didn’t write it because the possibility of a draw was looming large in my mind. In the end, it wasn’t the prettiest game Arsenal will ever play but it was pretty effective. Wenger went with the same line-up that did the job against Wigan despite Giroud’s availability, which again showed continuity is very important to the Frenchman’s system and thinking. At the start I got a feeling Arsenal wanted to make sure they didn’t lose this game before they thought about winning it. The tempo wasn’t as quick as we’ve seen at the start of some recent games. Fewer bodies were committed in attack and high pressing was utilized very occasionally. The players seemed more interested in holding their shape and keeping things under control. Despite that, or because of that, it was Newcastle who looked the more threatening team. They were constantly looking to get in behind Arsenal’s defensive line with Gouffran making runs and forcing Mertesacker into choices and actions that made him uncomfortable. At times, their full-backs also made forays down the wings and into space with the best opportunity falling to Cisse from one such burst by Yanga-Mbiwa. By my count, Mertesacker made four or five mistakes in the opening half hour which might have proved costly against a team that had more at stake. I thought Arsenal got away with it initially as the hosts had very little to play for and didn’t really put in enough effort to convert their promising moments into shots on target. Then again, it’s been a problem for them all season so maybe it wasn’t just a function of being safe. There was also this feeling in that opening half-hour period that Arsenal had an extra gear that wasn’t yet engaged. I don’t know if it was the dreaded handbrake that was holding them back or just prudent and patient tactics. Perhaps, a bit of both. Wenger’s men did go close on a couple of occasions and both were from set-pieces. Koscielny got his head to a corner and his effort went just wide of the far post. It was a shame no one attacked that region. Later it was his central defensive partner who got something on a Walcott delivery. Coloccini almost headed that into his own net. The second half was different. Mertesacker upped his game and, along with the consistently excellent Koscielny, did enough to ensure Szczesny’s goal was well protected. I don’t think Newcastle had any opportunities in the Arsenal box despite seeing a lot of the ball. In fact, the entire team deserves credit for defending well collectively. It was one of those games which I’ve seen from the likes of Chelsea and United in the recent years – Make sure you don’t lose and then find a goal from somewhere. Arsenal’s goal came from somewhere alright. For the second year in a row Koscielny pounced on a loose ball in the box to make the decisive contribution in the last game of the season. A freakish moment in the box was the most likely source of goal for the Gunners as they weren’t creating many chances or taking risks from open play. Newcastle were poor at defending set-pieces in this game but I doubt anyone supporting Arsenal will complain. The end was a bit nervy but given the strong run that Arsenal are on, and the observations that I’ve made in the last few games, it seems only fair to give the players enough credit by saying they were in control even if it was from a defensive point of view. Indeed, it’s a pleasant change and hopefully a sign of things to come in the future because there haven’t been many occasions in recent seasons where you could say Arsenal controlled the game without the ball. Szczesny: Relatively easy day for the Pole. Sagna: Of the two full-backs, I thought the Frenchman had the easier game as Newcastle didn’t try to get behind him as often. Gutierrez was regularly pulled back to double up on Walcott and that made Sagna’s job simpler. Nevertheless, it was a solid and error-free game from the experienced defender and it helped Arsenal’s quest of keeping a clean sheet. He also did a good job of holding on to the ball and pressing it when high up the pitch. Won the free-kick that resulted in the goal through clever use of his body. Mertesacker: Really struggled in the first 30 minutes or so. Yanga-Mbiwa went straight through him, there was another occasion when he went to ground without getting any of the ball, and so on. Had that sort of decision making and form lasted the whole game, it would have been tough for Arsenal to shut Newcastle out. But he raised his game after the early hiccups and made vital contributions in and around the box during the rest of the game. Koscielny: Clearly the MotM in my opinion. Decisive in both the penalty boxes and thus influenced the outcome more than any other player. Perhaps a fitting closure to an excellent run of form in the last few weeks of the season. Gibbs: Newcastle produced a number of half-chances from wide on their right but I didn’t think Gibbs was at fault. It’s worth noting that Debuchy was the man delivering the ball more often than not when the Arsenal full-back was tucked in narrow. It could be that Pardew noticed Cazorla’s tendency to roam and instructed his right-back to push up at every opportunity. Whether it’s an individual’s fault or that of the system, Arsenal will have to find a way to plug this hole or more teams will exploit it next season and the defence won’t always hold out. On the whole, apart from a few iffy moments from the German, the back five had a comfortable, even commanding, game that provided the platform for a scrappy but immensely important win. Arteta: Looked alright in the opening exchanges but didn’t last long. He might have been playing through some pain and it must have gotten beyond bearable limits. I like the fact that he came off instead of trying to be a hero when his body wasn’t responding at the level needed. Rosicky: Attacking influence was limited to playing the ball out wide on the right. His presence in the central areas was helpful from a defensive point of view and his discipline was commendable. Ramsey: Another tireless performance that typified the current tactical approach – It was more about hard-work than artistry. Was helping his teammates all over the pitch without really standing out through individual flair. Cazorla: Debuchy’s adventurous runs will give him and Wenger something to think about before the start of the next season. This wasn’t his most eye-catching display but was still the Arsenal player most likely to make something happen from open play. Oxlade-Chamberlain: I was a bit surprised when he came on in place of Arteta and remained central. It’s an area he is likely to command in the future but there was little to read from this particular effort. It was a relatively comfortable display from him in an unfamiliar role but was helped by the fact that the team largely stayed together and deeper. Industrious performances from technically competent players who perform the basics without mistakes can go a long way in paving the path to success, particularly in tough-ish games. This is not how Wenger wants his midfield to play but if they could pull out such displays more consistently (when required) it will show in the final numbers tally and even in the Cup results. Podolski: Does he get the assist? At least he was there and duelling for a cross that was hit behind him, that itself is a good sign. This might sound strange for a team that likes to play silky, one-touch football, but I get a feeling sometimes he plays the ball too quickly. His teammates are not at the same wavelength and occasionally his pass is too impractical. He will have greater influence on proceedings if he can sync his thoughts with those of his attacking cohorts rather than playing largely instinctively. His pressing and defensive effort in this game seemed better than some of his previous efforts. Walcott: Gutierrez and Mbiwa doubled up on him almost all the time, but it was good to see him attempting those dribbles. He’s taking more and more responsibility, which is a sign of maturity. At the moment the output is not quite there but the direction is correct. Good game, would have been great if he had converted his chance. The forwards were isolated at times and had limited offensive impact. Did their jobs in support of the midfield and defence, which made a noticeable difference. Subs: Giroud had greater presence in the attack and even in front of the defence when he fell back. His tenacity was crucial to Walcott’s big chance. I didn’t really notice Wilshere apart from that sliding foul, have no idea why he was brought on. Wenger: Hit the bare minimum again after being written off completely. Definitely made a lot of people happy by finishing above Spurs and in the Champions League places. Defensively the team is better but not quite there. I’ll cover those issue and other aspects like balance and individual performances in the season review series. There were no surprises in Arsene Wenger’s team selection and, thankfully, there were none on the pitch either. It wasn’t a perfect game from the Gunners but an eight minute spell of exceptional efficiency and clinical finishing settled the game midway through the second half. It followed patterns that we’ve seen in many recent games so I won’t dwell on them. 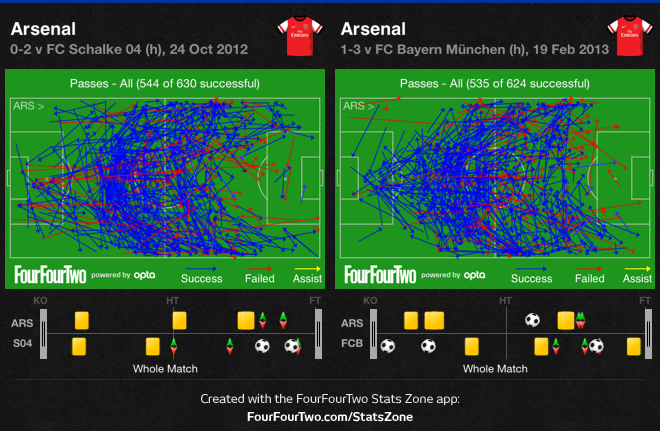 Arsenal controlled the opening exchanges and dictated the tempo early on. But they didn’t really convert that into quality chances and the goal came from an unexpected source, a corner. Wigan’s defending was terrible and will probably be identified as the chief reason of their troubles this season. In most other Arsenal games, I’ve seen such corners gobbled up by the Keeper or easily header clear by the defenders. Balls put in so close to the goal have rarely troubled the opponents leave alone result in goals. In this game it came all the way to Podolski who was left unmarked. The German showed good composure even when the manner of scoring was not his speciality. How many headers has he scored in his entire career? The hosts slowly relinquished control over the tie after the goal. Wigan started seeing a lot more of the ball in advanced territories from midway through the first half to the end. But Wenger’s team remained defensively compact and dealt with any danger. Szczesny was largely untroubled. Only that one ball over the top of the defence comes to mind but Koscielny found a way to clear the threat. I thought Arsenal were defending with a clear 4-1-4-1 shape which seemed a change from their usual approach as Arteta sat really deep in midfield just in front of the defence whereas the other midfielders formed a line a few yards in front of him. The Spaniard’s positioning meant it was difficult for Wigan to build anything through the middle and Kone’s influence was minimized as he can drop deep to receive the ball and hold play while other join in. The discipline of the four in front of him and structural integrity achieved through that also limited openings for Wigan to exploit. It’s worth noting that the visitors actually had more possession, played more passes, and had greater passing accuracy than the hosts, but they couldn’t create many chances. Their goal came from a soft free-kick. I’m sure Arsene would have complained about it if points had been dropped. Maloney’s strike was superb but I was surprised Podolski didn’t jump. I’d think the wall needs greatest height at the far end where the goalkeeper would find it hardest to cover. Anyway, that’s one for the coaches to analyze. Wigan came out with greater purpose in the second half as if their late equalizer had instilled genuine belief. Kone had their best chance early in the second period when a seemingly fortuitous one-two put him through. Szczesny did well to close the angle and made a convincing save. Arsenal were not really getting control of the ball or territory in the second period but they started exploiting the space behind Wigan’s defence, particularly with attacks originating down the right side behind Espinoza. First, Walcott fed Cazorla who couldn’t score with two good attempts, probably the only blot on his otherwise impeccable worksheet for the day. Then Rosicky played Theo in behind but he could not find enough power or precision with his shot after choosing to ignore Podolski’s run that was marked well by Boyce. Soon after, the Gunners did take the lead. This time it was Cazorla making a run down the right. It’s worth noting the interchange of positions between the players as Theo had gone central with Podolski wide on the left. Arsenal played eight passes in the build-up to that goal and stretched the play horizontally before going vertical. Nonetheless, it was again terrible defending and goalkeeping that cost the visitors. If that was bad defending, very little should be said about the mess they created for the third. Szczesny’s long ball was headed into the danger area by Alcaraz. Meanwhile, Scharner had dropped a good five yards deeper despite no Arsenal player making a run. Cazorla’s header was deftly cushioned but completely unchallenged. In the same manner, Podolski’s clip was predatory and superbly executed but way too easy for this level. The fourth came from a simple ball down the left flank that caught the entire Wigan defence unawares. Espinoza played Ramsey onside. The Welshman’s finish was emphatic and brilliantly disguised. The Gunners could then relax as the visitors had lost their appetite for the fight they were clearly losing. All teams face the problem of balance. Wigan have troubled the Gunners when they’ve been able to defend deep for long periods. I was surprised they opened up so soon in this game. Playing it tight and throwing everything forward in the last 10 minutes would have been a much better tactic for them. Their confidence in the second half proved their undoing. Kone’s missed chance was also vital. At 1-2 up they could have reverted to a deep defence and might have shut the Gunners out as they did last season. That Arsenal conceded was not a surprise, but I was impressed by the way they limited the visitors’ chances despite conceding possession. The team’s defensive shape and the choices made by individuals was commendable. As was the manner in which they covered for each other. There were times when I saw the likes of Gibbs and Walcott pop up deep in the Arsenal penalty box on the right side to make tackles and recoveries. A good defence has to be a team effort and the Gunners seem to be improving slowly but steadily. Szczesny: Don’t know if the coaches will fault him for the shape and positioning of the wall. Good save from Kone. Distribution was average. Sagna: Most of Arsenal’s threats came down the right and the Frenchman played a good unobtrusive supporting role as he was there to help but stayed out of the way of the creative players. Had very little to do defensively in the first half as Wigan focussed on the other flank. Received useful cover from teammates in the second. Mertesacker: Made some important tackles around the edge of the box and his positioning was consistently good. His only mistake was probably the occasion he went to ground to make an interception near the centre line. It opened space up for Wigan and resulted in McCarthy’s goal that was just marginally off-side. Didn’t see as much of the ball as he usually does because the Gunners conceded possession. Koscielny: Made a couple of big interventions in the box. Should probably have scored from the corner that fell to him invitingly. Steady game on the whole. Gibbs: Did a good job on McManaman and kept Wigan’s most creative player quiet. Passing wasn’t as reliable as Arsene would want from his full-back and made a very limited contribution in the attacking areas. The back five had a good game without being spectacular, but they didn’t really have to produce anything special. The team defended as a unit and they remained well protected for most of the game. Arteta: Gave away some fouls, one of which resulted in the Wigan goal, but you could wonder if another referee would have called those. Passing was below par but it was his positioning and tendency to drop back into the defensive line which often plugged crucial holes and forced play away from the danger zones. Rosicky: Showed good energy, particularly early on. Defensive contribution was noteworthy from a discipline point of view as he protected some central areas that Wigan seem to favour. The quick turn and through-ball for Walcott was the most eye-catching moment of the game for me. Ramsey: Here, there, everywhere, and pretty effective. Saw a lot of the ball and made telling contributions at both ends of the pitch. Took his goal really well while constantly looking/faking to cut the ball back. Cazorla: Four assists! And different ones too. I wonder if he’s ever picked up an assist with his head before. Was a constant source of inspiration for the Gunners that turned lethal once Wigan pushed up and lost control over their shape and distances. Defensive work rate on the left was also exceptional and he helped deal with McManaman (Is it a coincidence that Arsenal picked up three quick goals soon after the youngster was taken off?). MotM in my opinion. Walcott: Picked his moments to move inside carefully and stayed wide often to exploit the space available. This Wigan defence, particularly in the second half, was perfect for him as they were wide open with huge gaps between the lines and individuals. Credit to him for using the opportunity as he linked well with Cazorla and Rosicky. Converted his chance without a fuss, even if there was an element of luck to it. Defensive contribution deserves a mention. I thought the midfield deserves bulk of the credit for this win not only because of their contribution to the goals but also for their effort in front of the defence. A while back it wouldn’t have been hard to imagine this Wigan side playing one-twos and constantly exploiting the gaps in front and behind the defence. In this game the midfielders cut out almost any opportunity for the visitors to develop their combinations and thus left the back four with a very manageable task. Podolski: Took both his goals really well to reaffirm his status as the best finisher at the club. Still far from his best in this role but the goals should help his confidence and that of his teammates. His horizontal movement was good and he often dropped back to add bodies in the middle. Subs: They came on after the game was virtually over. Wenger: Should be pleased with this win. The performance was far from ideal but it carries some encouraging trends forward. The team certainly looks much more balanced than it did at the start of the season. However, one big test still remains before any real plaudits can be handed out. Congratulations to Wigan for their FA Cup success. Regular readers know they’re one of my favourite teams from among the so-called smaller clubs. Martinez is an impressive young manager and his players have produced some entertaining, high quality football over the years. It’s good to see their work rewarded. Cup ties are inherently of a knockout nature meaning both teams have to go for a win. But in the League it’s rare that both teams face an absolute must win situation and that too at the opposite ends of the table. You might argue that the Gunners would still have a chance of finishing in the top four if they didn’t win this one, but in my opinion the team that doesn’t win this game will see it’s League hopes crushed. For Wigan, that would mean relegation, while Arsenal will more than likely miss out on the coveted Champions League spot. This is another game where the view you take is likely to depend on your mentality. The Latics are renowned for their late comebacks to survive in the League (they’ve won the last two games of the previous two seasons) and a win at the Emirates (something they achieved last season) will give them a genuine chance of pulling it off again. One could argue the Cup win will lift them and the players will find extra energy and motivation. Momentum can be a strong positive force in football. Someone else might say they’ll be tired and could suffer from a hangover of success and celebrations whereas the Gunners will come into this game feeling revitalized due to a noteworthy break in schedule. I think we’ll see a committed game from both sides and any side-effects of Wigan’s weekend heroics will only be visible in the later stages of the game, if at all. There is an interesting pattern to the games between the two sides. Apart from Arsenal’s 0-1 win earlier this season at the DW stadium, the Gunners have not won against Wigan by a single goal margin going back to 2009. Either Arsenal win big (1-4, 4-0, 3-0, 0-4) or they drop points. Wigan have won with scores of 3-2 and 1-2 in this period while also picking up a 2-2 draw. In other words, either Arsenal win relatively easily or they drop points, even lose the game. The win in the reverse fixture bucked this trend somewhat and Arsenal’s recent tentative but resilient performances suggest that it could be another close encounter. Wenger will hope that his side can scrape together enough goals to win this one. He’ll want a clean sheet but I doubt he’ll get one. It could be a question of who makes the least defensive mistakes and which side takes its chances. Arsenal’s problems against the Latics have generally resulted from individual or collective defensive weaknesses. Whether it’s counter-attacks like last season or set-pieces from an earlier time, the visitors will provide multiple offensive threats that have to be dealt with in a consistent and reliable manner. Martinez has built a side that can retain possession and build attacks. That doesn’t mean they’re likely to match Arsenal’s possession or passing statistics but they will be able to pass it when they win the ball back. This gives them a chance to construct more meaningful attacks compared to the kick-and-hope outfits. It was visible in the FA Cup final when they spent a lot of time in front of their own penalty box but always looked a threat when going forward. Kone is an intelligent striker who shows for the ball and can hold it or lay it off quickly. He makes useful runs into the channels and can get on the end of crosses or through-balls. The youngster McManaman provides guile and pace on the flank. I like the way he shifts his weight to trick defenders with numerous feints. Martinez also seems to get the best out of Maloney who can cut inside and join the striker, particularly when McManaman goes in behind. Gomez is inconsistent but has an eye for goal. Espinoza has been a handy acquisition and adds to the threat from their left flank. Their midfielders are steady players who can occasionally step up and make a difference with shots from distance or on counter-attacks. The Gunners will have a tough time defending their flanks on quick transitions and the full-backs will need a fair amount of support. I find it hard to categorize Wigan defensively. They can have anywhere from 2 to 6 defenders in a line. 3 is the usual number, but when they drop back and the ball goes wide the defensive line can have as many as six players, thus cutting out spaces. Some of these players push up when the attack is through the middle and that way they have layers and covering players to protect the vital central areas. In such cases the gap between their lines is almost non-existent. There are mistakes in their defence and Arsenal should get chances if they can play at a fast enough tempo but the Gunners will need greater lateral movement in front of the Wigan backline and more penetrating runs in behind. Otherwise it could again be a case of a lot of possession at one end and the dangerous chances at the other. An early goal for Arsenal can open the game up but it could also leave the Gunners in a tactically confused state, not knowing whether to push forward or step back. Wenger has most of his players available. It’s tough to predict his choices for this game but I have a feeling it will be the same team that started against QPR with Gibbs coming in for Monreal. The Spaniard struggled against Townsend and it’s not difficult to imagine McManaman running rings around him. Hopefully, Gibbs will be fit. If nothing else, he has greater pace to recover. Fabianski is fit again but I doubt Wenger will take Szczesny out of the starting line-up. Szczesny – Sagna, Mertesacker, Koscielny, Gibbs – Ramsey, Rosicky, Arteta – Walcott, Podolski, Cazorla. I’d be tempted to find a place for Gervinho or Oxlade-Chamberlain because having a player who can dribble is useful against a deep-lying defence. But both those players bring their own set of weaknesses to the side and affect the balance. As I’ve noted before, there isn’t an obvious correct answer here and the result could vindicate a choice or make it look stupid. Finding a way to use Podolski’s skills and getting him into scoring positions or areas where he can play penetrating one-twos could be vital. Arsenal have been starting games well off late but this was something special. If I’m not mistaken, QPR only had one touch after kick-off before Walcott slotted the ball home. That was a bad one though, and a big part of the problem for the hosts, as Traore headed a ball straight across the face of his penalty area. For the Gunners, a number of small details fell into place, or you could say the players chose the right options and executed them well. For instance, Rosicky could have stood the ball up in the penalty box but he measured his cross and found Ramsey. The Welshman could have attempted an ambitious header towards goal from there but instead he chose to head it back towards Arteta who’d also joined the attack. The Spaniard picked the right through-ball and Walcott did the rest. It was an excellent team goal. Gareth Bale’s late long-range strikes can be very exciting to watch but a well-worked early goal is just as effective. I have talked about this problem throughout the season so I don’t want to dwell on it any further. I don’t expect it to change this season. A few other points are worth noting. As I’d mentioned in the preview, City, Chelsea, Spurs, and Everton had all picked up just one point from this fixture. It was not an easy game. The margins are very small at this level and it’s important to understand the doubts that players can have and the impact those doubts can have on the result. It’s easier to appreciate the performance with that in mind. Arsenal had not won in five visits to this ground and they’d not scored more than 1 goal against QPR in any of their last 3 meetings since the R’s were promoted in 2011. As I’d said in the preview, a clean sheet was going to be vital to success. Sometimes perception is also affected by the timing of the goal. Many fans would have been euphoric if the game had been won with a spectacular goal in injury time. We start preparing our minds for a disappointment and a late turnaround is such a boost. An early goal, on the other hand, builds expectations right up. If the rest of the period is more about grinding a result out with a few nervy moments thrown in, the euphoria is lost. Whether this team is good enough to compete for the title next season or not is utterly irrelevant at this moment, particularly in the context of this game and the importance of the points. But the nervous period gives everyone enough time to think and fret over it. The quality of football played wasn’t very good. Both sides were pretty average. The hosts showed why they got relegated whereas Arsenal played it safe and spluttered forward in second gear. QPR had a couple of decent chances but they did not have a single shot on target from inside the Arsenal box. The Gunners defended the vital areas really well. I thought the central defenders took responsibility and did a very good job. Part of the problem for Arsenal has been that they have a tendency to concede soft goals and drop points in such games. It’s happened so often that the memories of those games takes away any joy fans can get from such a performance as the time is spent dreading a wicked deflection or a dubious penalty call or an absolute howler from an individual or two. In this game the odds of that happening were very low even if most of us didn’t feel that way. Arsenal weren’t anywhere near great from a defensive point of view but they were mostly steady with good concentration and the work rate showed a genuine desire to keep a clean sheet. There are times when I watch the defending and think,” it wasn’t very good, they just got lucky.” That was not the case in this game. Szczesny had a couple of saves to make but they were the kind that most keepers make routinely. The fact that many fans thought he was the man of the match just shows how flawed perceptions impact opinion. The defenders won almost all of their aerial duels, which is often an Achilles’ heel. The hosts attempted a number of balls in behind the defence but the Keeper and the central defenders showed good understanding of situations and dealt with these without much alarm. QPR played with two strikers and Arteta did an excellent job of supporting the defence ensuring that the central defenders were not isolated against the strikers. Arsenal’s attack could have been better. It’s been an issue all season if you leave out the uncharacteristic high scoring games. The players still don’t read each other’s movements well. For instance, there was a moment when Rosicky picked up the ball on the left flank, Podolski took up a good position just inside the penalty box to the left of centre, the Czech played it to his feet and the German was able to receive and hold off the pressure from the defender. Then Little Mozart made a straight run expecting Podolski to roll the ball back to his left from where he’d have had a good chance of shooting. The German thought Rosicky will run in behind and laid the ball off towards his right and behind the defence. The move completely broke down. A lot of details were good, particularly the way Podolski received and held on to the ball in that area. The understanding just wasn’t there. There were many other occasions where a similar argument could be made. Better quality always helps and I hope Wenger is able to add to the squad strength but at the moment that is not the primary problem. Any newcomer won’t be able to help the team if the players show tactical confusion, indecision, or don’t read each other’s play. I do think the next two games will be tougher than this one and we’ll have to see if the defence can hold as firm in those. Szczesny: Made a couple of good saves and there was that one occasion when he just diverted the ball away from a striker’s head. It’s sad that people don’t think this is a normal day for a goalkeeper. Sagna: Did a good job of blocking some crosses and made a few useful clearances. Was a much easier game for him when compared to the previous one. Saw a lot of the ball and was reliable in possession. Mertesacker: Got his foot in at the right moment on more than one occasion, won all his aerial duels, and made some much needed clearances. Passing accuracy was probably low because of the fact that QPR had two strikers and they didn’t give the central defenders enough time on the ball. Koscielny: As is usual, he was again the busier of the two central defenders. Had many more duels to contest and he also made a couple of useful blocks. Stuck close to Remy when the striker moved wide and limited the impact he could have from those areas. Did a decent job of covering behind Monreal. Monreal: Was probably the only defender who had a tough day. Townsend was able to get past him with relative ease. Should have compensated for pace by better positioning but he couldn’t quite pull it off. As mentioned above, the central defenders had good games. Teams with two strikers have troubled Arsenal at times this season but in this game they dealt with the situation well. Similarly, ball over the top are a long standing weakness but they made the right choices and communication appeared to be clear and precise. Arteta: Very good assist and excellent supporting work in front of the defence. MOTM in my opinion. Rosicky: Another one who made a useful defensive contribution, particularly in the central third of the pitch. Work rate was very good and he saw a lot of the ball but wasn’t able to find the unlock the defence despite getting into some promising positions. Ramsey: Probably worked harder than anyone else and was all over the pitch adding the extra body where needed. But I also noticed a number of mistakes in his game, like that minute in the first half where he twice lost the ball because he wasn’t alert to someone closing him down from behind. Over time he’ll learn to pick and chose his moments to join the attack and will divert some of his energy into looking around the pitch and reading the game a bit better in order to have greater meaningful influence on the game. Cazorla: Pretty good by normal standards, below par by his own. Exhaustion seems to be part of the problem and the lack of understanding with some teammates the other. Would like to see him get closer to Podolski, play on the defensive line, and even look to get in behind. The midfield didn’t quite find the fluidity or penetration that we know they’re capable of. But they made up for it with defensive effort. Not a game they’ll talk to the grandkids about, but one they’ll be pleased with nonetheless. He has improved his ability to resist to pressure from the opponent. Podolski: Often had to drop too deep to receive the ball, should be receiving more in and around the box. Made a couple of good runs down the left channel and Walcott will be disappointed he didn’t do better with one of his crosses. Doesn’t look like an Arsenal striker at the moment as the understanding with the others is missing and he also has a lot to learn about that role when playing against crowded defences. Subs: The substitutes didn’t get enough time to make an impact. Wenger: I’m convinced the attack is not to his liking at the moment but he probably can’t change much right now. Defenders did well in this game and that should be encouraging. The quest for balance and search for confidence continues. PS: If you haven’t had a chance to read it yet, do spent a few minutes on my analysis of Bayern’s win over Barcelona. It’s more about a key territorial battle between the possession and counter-attacking styles and is relevant to Arsenal from both sides! QPR have been relegated and have nothing to play for, their players lack motivation and have underperformed all season, so they’ll be lazy and disjointed. The R’s are going down and have nothing more to lose so they’ll play without fear or pressure. The liberation would allow their talented players the opportunity to express themselves and they’ll be very dangerous. The squad will surely be culled in the summer and many players who might leave will feel little connection with the club so they won’t perform anywhere close to their best. This is a good opportunity for players to prove themselves and secure better transfers in the summer. I can go on and on but you get the drift. One could build whatever narrative one feels like. As fans, sometimes we go by our feelings. A name like Manchester United makes us feel different than a name like QPR. There is almost a degree of entitlement involved when thinking about opponents at the wrong end of the table. A thought like, “It’s QPR! What’s the point in playing if you can even beat them!” might cross many minds. The Premier League is the Premier League and you don’t win 3-0 or 4-0 in many games. It is always tight. QPR have lost only 1 home game out of 5 games against the other teams in the top 6. City, Chelsea, Spurs, and Everton have all drawn at Loftus Road. They’ve also won at Stamford Bridge! Strangely enough, despite the respectable results against the bigger teams, QPR have the worst home record in the League with just 2 wins in 17 games while scoring just 12 goals in the process. That’s the other side of the story. For Arsenal, these type of games inevitably boil down to terrible mistakes and Loftus Road has some bad juju! The Gunners have not won a Premier League game at that ground in 5 attempts. In the more recent and relevant games, since their re-entry in 2011, the teams have won home games by a single goal margin. The Gunners won the two games at the Emirates by a goal to nil but lost in the last visit by a goal to two. Unless the hosts give up and crumble, this game could again boil down to a single goal result. At the back, Arsenal will have to deal with Remy’s pace and the individual skills of Taarabt. Pressing high up the pitch has improved in the recent past but will remain a risk if the defenders are isolated against quick and tricky players. I have a feeling Arsenal will need a clean sheet if they want to get three points from this game. QPR’s organization, when they drop deep, is fairly good, ignore the impression their position in the table might give. Three of the aforementioned draws against the top six teams were goalless while both teams scored one when Everton visited Loftus Road. In other words, Chelsea, Spurs, Everton, and City have only scored 1 goal between them at this ground in 360 minutes of football! I have a feeling the R’s are able to defend against the bigger teams because they might think a point is good enough and thus they don’t have to commit too many bodies to attack. That way the problem of balance doesn’t crop up and they remain relatively secure at the back. It could be a long, frustrating game for the Gunners if the hosts decide to stay deep, narrow, and organized. An early goal would make all the difference and the blazing tempo we’ve seen at the start of some games could come in really handy in this one. I don’t think any of their defenders is individually outstanding but good structure and discipline can make up for that as they would cover for each other and close down the limited spaces in the central areas in front of goal. The Gunners might be forced wide and that old weakness could prove annoying again. Podolski’s ability to play in tight spaces can be useful if Arsenal can get him on the ball and get players close to him. It’s not very hard to imagine Wilshere dribbling past one or two and then getting in behind by playing a one-two with the German. Poldi will have to deal with Samba’s physicality, which might be a new and substantial challenge for him. Wenger might also want to consider if he wants to pick Walcott on the flank. Oxlade-Chamberlain or even Gervinho might offer better dribbling skills that could be needed against a deep and narrow defence. Theo, as we’ve seen all too often, doesn’t quite enjoy playing against such defences. If it were up to me I’d also give Santi a break as he’s looked a touch off his best in recent games. A more direct winger or Rosicky could be used on the left. But I doubt Wenger will keep his most influential player out of the starting line-up, not with CL qualification at stake. Szczesny – Sagna, Mertesacker, Koscielny, Gibbs – Arteta, Wilshere, Ramsey – Oxlade-Chamberlain, Podolski, Rosicky. Has this front six ever played together this season? Probably not, but I feel they can do the job as long as the Gunners don’t rediscover their gifting instincts. History is not on Arsenal’s side and it might be a case where patience, spirit, and desire prove vital to success. On an unrelated note, if you like the tactical analysis on this blog, make sure you read my previous post analyzing Bayern’s dominance over Barcelona. It also touches upon Arsenal’s games against Schalke and Bayern along with a couple of Dortmund ones. But mainly it’s about a key territory in the possession vs counter-attack battle. If Wenger’s side can learn from the Germans they could go a long way in many competitions. For many it’s the end of an era and a number of observers have witnessed a change of guard at the top of European football. There are also those who wish to be more patient and see how the vanquished respond. Whether you belong to one of these categories or have an entirely different view, one thing is for certain, Bayern’s sheer dominance over Barcelona over two legs and the nature of their wins have given everyone some food for thought. Few would have predicted the Germans will win both legs when the draw was made. I doubt even the proudest, most passionate of Bavarian fans would have expected their team to knock seven past Valdes without Neuer picking the ball out of his net even once. Something extraordinary has happened here. I am sure by now you must have read a fair number of reports/analyses from different perspectives. Messi’s injury has obviously been a big factor. Vilanova’s long term absence due to his serious illness must surely have had an impact on the Barcelona squad given the fact that he was palpably, even if cautiously and slowly, trying to shift the team’s approach from the constant high intensity pressing we’d become accustomed to in the Guardiola reign. The lack of depth in the Catalan ranks, particularly in the centre of defence, is another valid reason. Key players might also be tired, mentally and physically, after years of consistency at the very top. Of course, we must be careful not to dilute Bayern’s brilliance by listing Barcelona’s problems. The Germans were stronger, sharper, and smarter. They had clear ideas – for instance, the use of set-pieces and aerial strength in the box – and executed them excellently. Heynckes’ team have deservedly received praise for their pressing, organization, discipline, work ethic, counter-attacking, and other attributes. I don’t want to go over these things again as many excellent writers have covered these in a manner beyond my current abilities. However, I do want to explore one particular angle that I found very interesting. It’s a very specific territorial battle that Bayern won in both games and thus denied Barcelona the chance to impose their trademark suffocating grip on the game. Before I get into what Bayern did, allow me to note certain characteristics of Barcelona’s style that has made them one of the best club sides ever put together. It is said that the defending side should try to make the pitch as small as possible while the attacking team should stretch the play. It’s widely accepted wisdom but sometimes we forget that the process of compressing the playing area and that of stretching it are physical acts where the players have to move around on the pitch and it takes time. And teams are often very vulnerable when they’re doing this because a quick transition can catch many players out of position. Barcelona, in my opinion, have a very unique solution to this as they compress play and stretch it at the same time. By basing their game on a short passing style and by insisting that the man on the ball be always provided with multiple passing options, the Catalans ensure that they always have a number of bodies around the ball. At the same time, at least one wide player and/or their full-backs consistently offers width up the pitch. The ability to understand and minimize the risk taken in possession has been a key to its successful execution and patience has been a vital attribute. As a result, when Barcelona did lose the ball they often had enough players who could immediately press as a unit and win the ball back within a matter of seconds (6 second rule?). Not only was the man on the ball put under pressure by two or three opponents, his passing options would be cut off by other Barcelona players who read the situations and swarmed in accordingly. The team’s shape played a crucial part in bringing the excellent tactical ideas to fruition on the pitch. Once the team settled into its rhythm after the initial exchanges, we’d see the central defenders on the half-way line, Busquets a few yards in front of them moving into carefully judged spaces to keep the ball rolling, Xavi would be around him again creating and using space, Messi would drop deep or move across horizontally till he got a chance to run at the defence or play someone else in behind. The wider players played their part making intelligently timed diagonal/vertical runs or by holding their positions or by cutting inside. The above is, without a doubt, a very simplified version of their tactics but it should rekindle memories of the patterns of play when Barcelona dominated games. In order for these tactics to succeed there is a very specific area of the pitch that Barcelona have to control. Take a look at the following chart of their passes against Milan in the 4-0 win at the Camp Nou in the previous round. It’s impossible to make sense of individual passes from that chart but we don’t need to. The density of passes is important. Most of it is just inside the Milan half. That’s the area where Barca set up their base camp before launching attacks. It’s the perfect territory for the likes of Xavi and Busquets to control possession and dictate the tempo. This is so because they need to stay at an ideal (short) distance from the central defenders who have to be on the centre line. Opposition strikers can be on the halfway line without being offside so no team would want to push its key defenders further forward during open play unless absolutely necessary. If the midfield pushed too far forward they’d be away from their defenders and into the opposition ranks in front of their penalty box. That’s not the right place for controlling possession because the risk of losing the ball would be very high, as would be the gap between their own lines which would make controlling transitions much harder. If they stayed deeper and pushed the central defenders further back, the team would be farther from the opposition box/goal and closer to its own penalty area and goal. Again it wouldn’t be ideal. In fact, Bayern succeeded in pushing them back but I’ll come to that in a bit. You could call that purple box, although an approximation, the control room for the suffocating Barcelona system. Attacks are built from there with carefully picked moments of penetration and all the players form layers around the ball. An attacking player might want to pass it back and Busquets or Xavi would be available to receive it. Behind them would be the layer of central defenders and even Valdes could receive a pass if the opponents got too close. Similarly, there would be midfielders available for sideways passes and beyond them, right on the flanks, either a full-back or a winger would be waiting. This layering also helped control transitions by quickly pressing the man on the ball and the first layer of options around him. What Bayern did, through superior physicality, immaculate organization, and astute decision making, was to wrest control of this vital piece of territory. The following chart compares passes made by Barcelona against the Germans in the two legs. The density of passing remains a very good indicator of where all the action was. The control room is sparsely populated. Barcelona had more possession deeper in their own half. Barcelona’s most frequent passing combination was Marc Bartra to Gerard Pique – a move that happened 21 times. The ball spent too long at the back, and Barcelona never picked up the tempo and piled on the pressure on the Bayern defence. …Song wasn’t disastrous in the holding role, but he lacks Busquets’ positional discipline and understanding of how to let the play flow naturally through him, and up towards the creative players. But it’s worth noting that in the reverse fixture Barca had the same problem even with Busquets in the starting line up. Refer to the passing density above and the fact that their most common passing combination in that game was Alba to Iniesta with 22 passes on the flank followed closely by, you guessed it, Bartra to Pique at 21 passes. Against Milan, who sat back, Busquets to Xavi and Xavi to Iniesta were the most common passing combinations, and many of those passes were in the control room area discussed above. 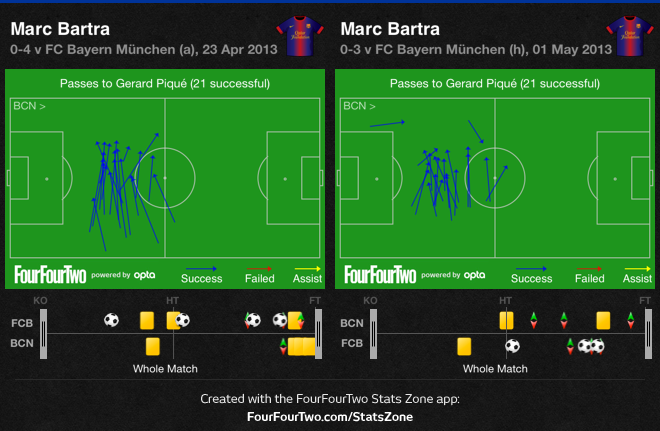 Whereas most of the Bartra to Pique passes were almost all 10-20 yards inside the Barcelona half in both the games. Against Milan, Barcelona completed 626 of their 715 attempted passes. In Munich, they completed 603 out of 666. The number or accuracy of passes is not very different. In no way does it explain how Vilanova’s side won the former game by 4 goals to nil while losing the latter with the same margin. But the positioning of those passes is more telling. 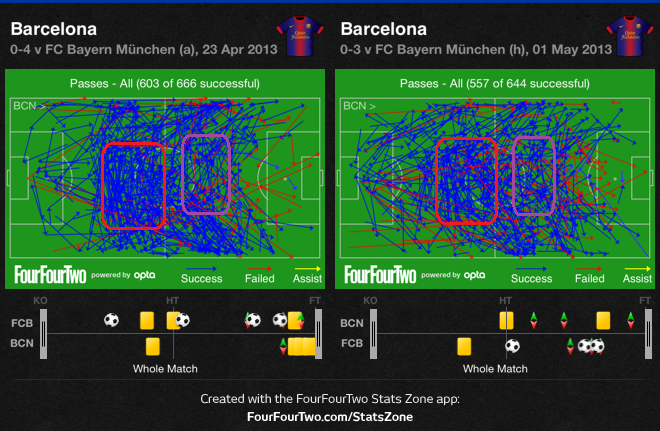 A few things happened as a result of Bayern successfully pushing Barcelona’s chief possession zone back by 20-25 yards. 1) Barcelona were further away from the Bayern goal and it was harder for them to bring their attackers into play. They were stretched vertically. This reduced the total number of attacks that the Spanish side could mount as well as the quality of the ones they did put together. Remember, they don’t like to play a direct vertical game. …while Barcelona’s sheer stamina in their pressing was frequently praised under Guardiola, less attention was played to the actual positioning and cohesion in the pressing – the player in possession wasn’t just closed down, all his other passing options were pressured too. Here, Barcelona’s ‘pressing’ seemed simply more like frantic chasing with other opponents left free. 3) As a result of 1 and 2, Bayern were able to hold on to the ball when Barcelona lost it (for longer than 6 seconds! ), remained relatively safe at the back, and were always a threat on counters. On the other hand, Vilanova’s side could no longer remain patient in possession in deeper areas, and their attempts to bring attackers into play were down to riskier passes that resulted in threatening transitions which could not be prevented by hard pressing as their shape was lost. It’s difficult to say just what percentage of that territorial battle was won by Bayern and what was lost by Barcelona. Surely, a fully fit Messi would have had a bigger say in that battle. But I’ve seen Real Madrid trouble their Catalan rivals in recent games through similar tactics by contesting that zone with some success, so I’m inclined to believe this is one of Barcelona’s (the possession game’s) genuine weaknesses and the Germans did well to exploit that. Heynckes’ team did that by constant and clever pressing. They never went overboard but consistently marked the key players. When they had to leave someone free it was usually the central defenders. Ergo the Bartra to Pique combination discussed above. Their man-marking was flawless but, equally, the players also picked the right moments and positions to let their man go and hand him over to a teammate. Most teams struggle at this against Barcelona because their movement pulls opponents apart and creates gaps in the defensive fabric. Bayern rarely yielded a yard of space, and never for a period long enough to be expensive. Mandzukic in this game, and Gomez in the previous one, often left the central defenders and dropped back onto the deepest midfielder. This gave them an extra body in midfield which was useful in dealing with Messi or Fabregas when they dropped deep. In turn, the Bayern central defenders were rarely pulled out of position. Furthermore, the discipline and work rate of usually attack-minded players like Ribery and Robben was praiseworthy. They often played as auxiliary full-backs when Barca did get the chance to move forward. It allowed Lahm and Alaba the luxury of staying relatively compact alongside their central defenders. Bayern’s backline maintained excellent spacing for most of the 180 minutes. Although further observations and analysis is needed on this, I get a feeling people within German football have identified the aforementioned piece of real estate on the football pitch as the key to finding the right balance between attack and defence. Observe the density of passes made by Arsenal in home games against Schalke and Bayern, both of which the Gunners lost despite dominating possession. Seems consistent with the discussion above, doesn’t it? Dortmund topped their group of death but had less possession than their opponents in all six group games. 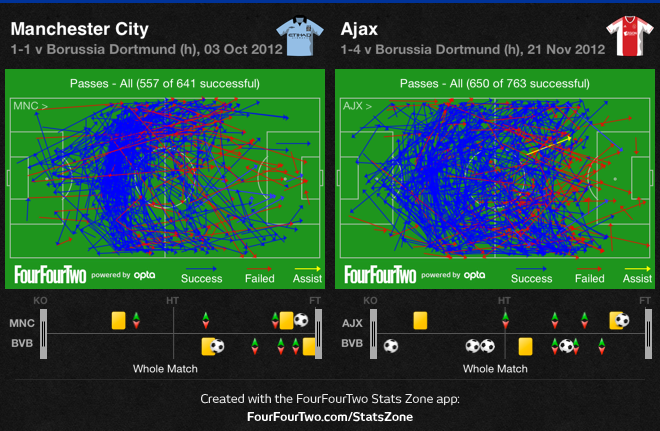 Away to City and Ajax for instance, the Germans did an excellent job of defending that space just inside their own half. While Barcelona and other possession based sides like to control that central zone just inside the opposition half from an offensive point of view, the Germans have shown that proactively defending that zone can lead to superb balance between attack and defence. Many teams concede that zone when facing technically dominant sides. Indeed, Chelsea and Inter have won the Champions League by parking the bus, so to speak. But it’s worth noting that they both ended up in the Europa League this season. Defending deep and hoping for chances on the counter-attack can work in the short term but it is rarely going to be a strategy that works over a long period of time, not to mention the sheer drudgery needed to survive in each game. The German approach, on the other hand, provides greater tactical control over games and the team with lower possession can often create more meaningful chances and look like the better attacking unit! Defending with the first line of players around the centre line or pressing the first ball out from defence is not a revolutionary tactic. But we must also remember that Guardiola didn’t invent short passing, pressing, through-balls, or a clever dink over the top. He found a way to put it all together meticulously in a system that suited the strengths of his players to a tee. The beauty was in the minor details and flawless execution time and time again. Similarly, it’s not that Heynckes, or Klopp, or other managers in the German system have created a novel tactical approach. But they seem to have refined it to a level where it could indeed create the new world order in football. I am possessed by that thought, do you have a counter? You are currently browsing the Desi Gunner blog archives for May, 2013.